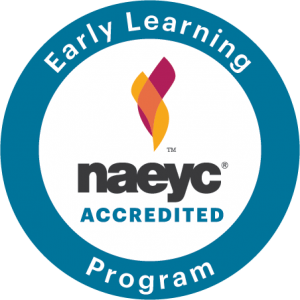 Sunbeam Early Learning Center is accredited by the National Academy of Early Childhood Programs. The Academy is a division of the National Association for the Education of Young Children, the nation’s largest organization of early childhood educators. Early childhood programs accredited by the National Academy have voluntarily undergone a comprehensive process of internal self-study, invited external professional review to verify compliance with the Academy’s Criteria for High Quality Early Childhood Programs, and have been found by a panel of early childhoo d education experts who meet in Washington, D.C., to be in substantial compliance with the Criteria Sunbeam Early Learning Center was first accredited in August of 1998 and continues to hold its accreditation. As in all accredited centers, children enrolled in Sunbeam will be provided with planned learning activities appropriate to the children’s age and stage of development and many, varied, age-appropriate materials by trained teachers; and frequent, positive, warm interactions with adults sufficient in number to respond to individual children. The Center and its staff have shown expertise in providing a safe and nurturing environment for the young children enrolled as well as promoting physical, social, emotional, and intellectual development.